Former U.S. 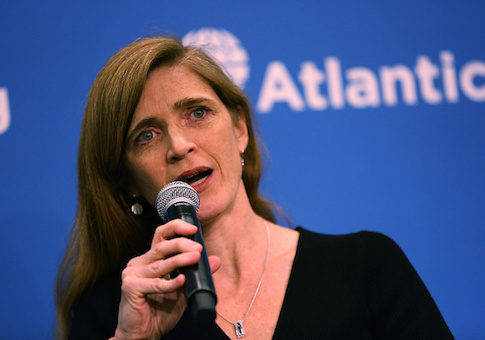 Ambassador to the United Nations Samantha Power "unmasked" some 260 people in 2016, including in the lead-up to President Donald Trump's inauguration, according to a new report. In July, Rep. Devin Nunes (R., Calif.), the chairman of the House Oversight Committee, wrote to Director of National Intelligence Dan Coats to inform him that the committee had learned "that one official, whose position had no apparent intelligence-related function, made hundreds of unmasking requests during the final year of the Obama Administration." That official is likely to be Power. Power, who served as U.N. ambassador from 2013 to 2017 during the Obama administration, did not respond to a request for comment from Fox. However, a previous statement from her lawyer noted that "while serving as our Permanent Representative to the United Nations, Ambassador Power was also a member of the National Security Council responsible for advising the President on the full-range of threats confronting the United States. Any insinuation that Ambassador Power was involved in leaking classified information is absolutely false." Previous U.N. ambassadors have made unmasking requests, Fox reported, but not nearly as many as Power did. Power is expected to testify before the Senate and House Intelligence committees as part of their probes into Russian meddling in the 2016 election; she will appear before the House committee in a private hearing in October. This entry was posted in National Security and tagged Samantha Power, Susan Rice. Bookmark the permalink.